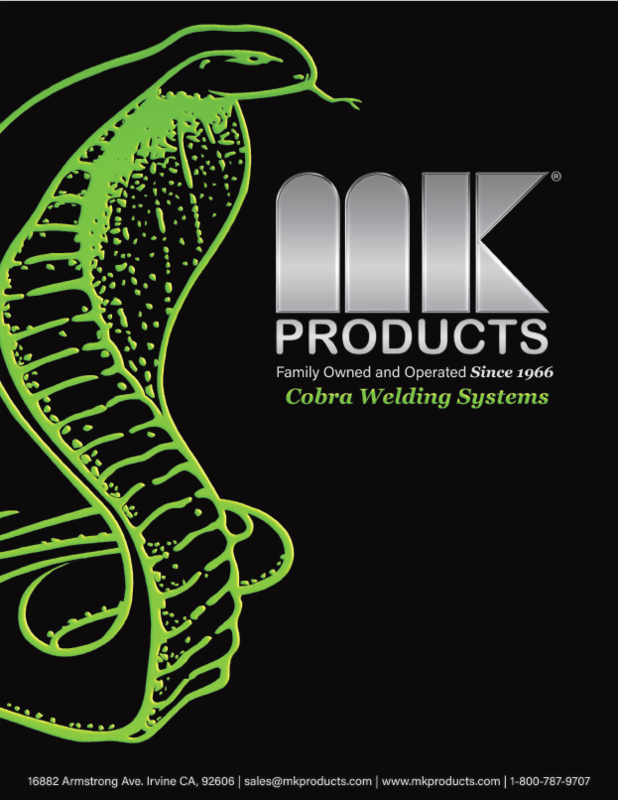 MK Products Catalog for Push-Pull Cobra® Welding Systems and Orbital Welding Equipment Our products include MIG welding guns: Python, LX, Prince XL, Cobra MX, Cobra SX and the Cobramatic Push-Pull MIG Wire Feeders, Spool Guns: include the Prince XL SG, Prince SG and Sidewinder MiniSpool™ gun. Our Orbital tube welding products, include the CobraTig® 150, Advanced Color Logic® (ACL), CopperHead® and the DiamondBack® weldheads. Also Positioners/Turntables. Check all prices with the factory before ordering. (800)787-9707. This price listing supercedes any and all previous listings. MK Products reserves the right to make changes to price lists at any time. The Product Catalog is a combination of all our printed literature into this one full product color catalog. This now means one source for all our product information and specifications. The catalog is a combination of all our printed literature.